The adventures of JEM and The Holograms continue with a talent search for a new member, an Aztec mystery, a trip to meet the President, a Hollywood film and more! Jem and The Holograms are producing hit after hit on the music charts, but keeping Jem's true identity a secret has been far tougher. Kimber, Aja, Shana and newcomer Raya are Jem/ Jerrica's best friends as well as the musical force behind Jem --- and the only people who know her true identity. Together, the girls provide cool cover-ups for Jem/ Jerrica while navigating some pretty sticky situations and battling their troublesome rival rock band, The Misfits! Just in time for Valentine's Day 2012! 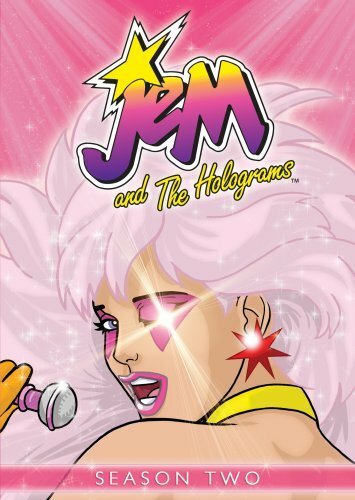 On February 14, 2012, the beloved classic animated series JEM and The Holograms returns for a second season on DVD when Shout! Factory, in collaboration with Hasbro Studios, present Jem And The Holograms: Season Two in a collectible 4-DVD set. Featuring all 26 original episodes from the complete second season along with special bonus feature Video Jukebox, this DVD set will be available in stores nationwide and is priced to own with a suggested retail price of $29.93. The series JEM and The Holograms ran from 1985-'88 in first-run syndication and still boasts a loyal and vocal fan base. It is frequently credited with influencing fashion in the late 1980s and beyond, and launching the careers of female pop-rock stars and music groups. The series follows Jerrica Benton, whose discovery of Synergy, a powerful computer companion, allows her to transform from owner of Starlight Music into rock star Jem. Teaming with her sister and best friends who form The Holograms, Jem sets out to make their musical dreams come true, even as she battles against the ruthless Eric Raymond and his musical proteges. Hasbro, Inc. (NASDAQ: HAS) is a branded play company providing children and families around the world with a wide range of immersive entertainment offerings based on the Company's world-class brand portfolio. From toys and games, to television programming, motion pictures, video games and a comprehensive licensing program, Hasbro strives to delight its customers through the strategic leveraging of well-known and beloved brands such as THE TRANSFORMERS, LITTLEST PET SHOP, NERF, PLAYSKOOL, MY LITTLE PONY, G.I. JOE, MAGIC: THE GATHERING and MONOPOLY. The Hub, Hasbro's multiplatform joint venture with Discovery Communications (NASDAQ: DISCA, DISCB, DISCK) launched on October 10, 2010. The online home of The Hub is www.hubworld.com. The Hub logo and name are trademarks of Hub Television Networks, LLC. All rights reserved. Come see how we inspire play through our brands at http://www.hasbro.com. (c) 2010 Hasbro, Inc. All Rights Reserved. Shout! Factory is a diversified entertainment company devoted to producing, uncovering and revitalizing the very best of pop culture. Founders Richard Foos, Bob Emmer and Garson Foos have spent their careers sharing their music, television and film faves with discerning consumers the world over. Shout! Factory's DVD offerings serve up classic, contemporary and cult TV series, riveting sports programs, live music, animation and documentaries in lavish packages crammed with extras. The company's audio catalogue boasts GRAMMY(R)-nominated boxed sets, new releases from storied artists, lovingly assembled album reissues and indispensable "best of" compilations. These riches are the result of a creative acquisitions mandate that has established the company as a hotbed of cultural preservation and commercial reinvention. Shout! Factory is based in Santa Monica, California. For more on Shout! Factory, visit shoutfactory.com.